14 ¼ x 11 ⅞ in. / 36 x 30 cm. 18 x 13 in. / 46 x 33 cm. 36 ¼ x 48 in. / 92 x 122 cm. 11 ⅞ x 10 ¼ in. / 30 x 26 cm. 10 ¼ x 8 ⅜ in. / 26 x 21 cm. 20 ½ x 18 in. / 52 x 46 cm. Time, memory and family are at the heart of Sue Stone’s mixed-media works. She merges the past and the present to connect personal histories and local identities through dream-like narratives. 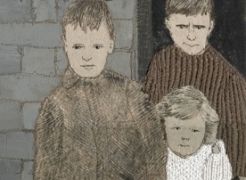 Starting with old family photographs, she interprets and transforms them through techniques that include hand & machine stitched embroidery, fabric collage, writing and painting. Stone is also deeply influenced by the history of her native Grimsby, England. For many years, Grimsby supported a major seaport and fishing industry, and where Stone’s father was fish merchant. The industry declined over time, but allusions to it remain in her work. Stone started sewing early on, learning from and working with her mother who was a tailoress until her early death. This sense of loss, and of displacement, in both emotional and economic terms, is an ongoing theme for the artist. While she will often make preparatory designs and studies, Stone “draws” her figures by directly stitching on fabric. At times she will use odd swatches from a piece of clothing once worn by the figure she is creating. At other times she carefully creates the figure’s clothing through a series of exquisite stitch techniques. We see parts of the unadorned base fabric come through, an indication perhaps that what lies beneath is as important as what is above. Hand-stitched text, relating a certain figures’ story, will sometimes also be added into the background. The figures that populate Stone’s imagery waft back and forth through time. In some works she shows several generations of relatives, all at once but at different ages. For example, in The Boys Go To London Town (2014) we see the artist’s father-in-law, along with his own father and uncle. They are dressed for a jaunt about Grimsby, with a classic car from the period. However, they are standing in a present-day London street. Interestingly, sometimes the location is Grimsby Street, in London’s East End. Sharing the same name as her home town, the area in London has also seen seen better days in the past, but is now currently undergoing gentrification as one of the city’s more interesting artistic hubs. Stone photographs graffiti during her travels, and has recently been incorporating it into her works. Graffiti can serve as a liberating symbol, a statement of fact to the world that an artist once existed in a certain place at a certain time. In this same way Stone often incorporates the image of a fish, a personal symbol of Grimsby’s economic past, and of her own. This combination of the real and the unreal, and of the then and the now, is also a balance between playfulness and intimacy. Sue Stone is currently the chair of The 62 Group of Textile Artists, an international select membership of textile artists. She studied fashion at St. Martins School of Art and embroidery at Goldsmtihs College, London.